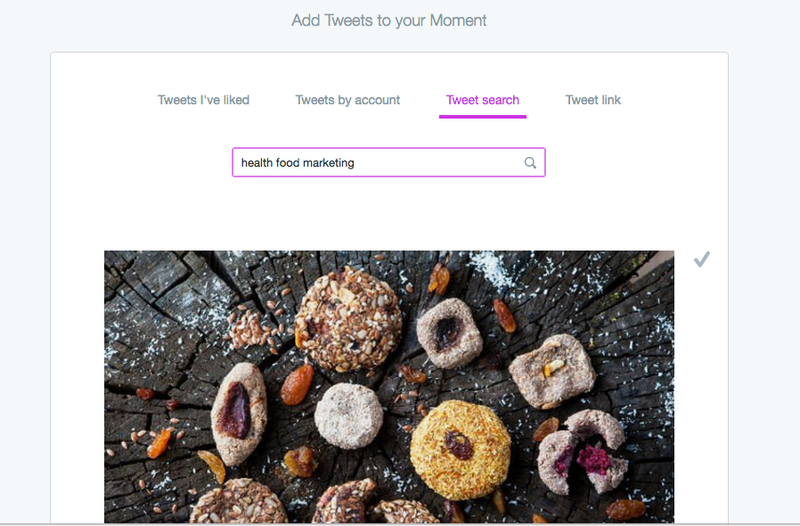 Your Business Needs Twitter Moments-Here’s Why. If you’re an active ‘Twitterer’, you will have probably noticed, in the not so recent past, that Twitter decided to add a new icon to their menu bar. Now, without looking can you tell me what it is? When you next take a look, you will notice a lightning strike icon and the title ‘Moments’ has been added snuggly between ‘Home’ and ‘notifications’. Twitter Moments is basically acontent curation tool, that you can leverage, to share engaging content with your audience. If you want to be one step ahead in your Twitter game for 2017, then stick with me. I’ll let you know, how you can craft effective Twitter moments and how to use them for your business. Hint: it’s especially awesome for your health food marketing strategy ???? This underused addition to Twitter enables the user, (aka, you) to grab together a load of relevant tweets and curate a collection that’s relevent to a certain subject or topic, your audience will be interested in. You might want a full collection of say,health food marketing newsor food trends. Maybe you want to showcase whats upcoming in fitness for 2017 or healthy holiday recipes your audience would like. Withresearch showing that 49% of all Twitter Users follow brands, rather than people, you need to make sure you’re looking good, and promoting relevant content at all times, right? Twitter moments is easy to use, compared to some othersocial media tools. First of all, navigate to the ‘Moments’ page. You can see from this screen grab, that it’s a collection of Twitter’s favourite moments that have been posted most recently. Stay on the Moments page. As you can see in the below image, there is a button just under your profile icon and tweet composer. Click it. (I told you it was easy!) This will take you to the Twitter moments creation page. First off, decide on what your moment collection will be all about. This can go in the title and description. It should be anengagingand creative description, that will make your users click and take notice. Once you know what you want to make your moment about, scroll down to see the options available. You’ll see the ‘Add Tweets to Your Moment’ option. This is where the curation comes in. Brands should tell theirstory uniquely and personably.You want to create that, in your moments. Make sure your brands personality and purpose is totally represented in your content curation. It’s good to have an identity. To create the moments, you have the option to scroll through your most recent likes, use your own (obviously brilliant) tweets or just start from scratch and do a full Twitter search for a new one. You can use your own tweets, tweets you’ve recently liked, or do a search of all public tweets. You can even add a link from a tweet, if you have it. Once you’ve found the tweet you need, click the grey check icon. Select a cover image that represents the content. You can use ( and crop for mobile) the current image in the tweet, or upload your own. This isimportant to grab users attention,whilst they scroll through their timelines. Click on the ‘…More’ tab in the top left and you will see a drop down menu. Note, that sharing the location will help you target specific users who maybe searching for businesses in a certain location. Once you’re happy with the moment, you can click publish in the top right corner. Choose to type a tweet and share to your followers, or you can do that later. When you’ve published a moment, twitterers will be able to distinguish what’s a moment and what’s a regular tweet by the ‘lightening strike’ addded to each tweet. The twitter moment is finished when you click ‘done’. You will see you lovely shiny new post, on your home screen. I like to tweet about health food marketing, but how would you go about actually using Twitter moments most beneficially for business? Want to boost your event marketing? You can create moments around your events that are up coming. Simply create moments around your posts, posts by sponsors or any videos you have recently launched. The benefits of using moments as events promotionare worth taking notice of. Maybe you’re showing at a health food expo or hosting a sports event? Think of how the moments will help you promote it on a higher level. By using your own composed tweets, you can let others know of updates surrounding the events, in a clearly distributed manner. They will know what to look out for. The location tagging and has tags, will help too. Got an event going on right now? You might be trading at a food market or hosting a huge retreat. Create moments that focus on certain aspects or thebest digital contentfor the event. For example focus on the key organisers or music performances at events. If you’re not following your influencers already, get on it! They are valuable in helping promote your moments. If you have celebrity guest writers or food journalists involved with your business, they can helpskyrocket your moments engagementwith just a simple tag. Maybe you’re not quite there yet. Even so, you can use your favourite influencer tweets and keep them at the top of your moments for full visibility. What moment’s are you creating? Leave your posts in comments ??? ?